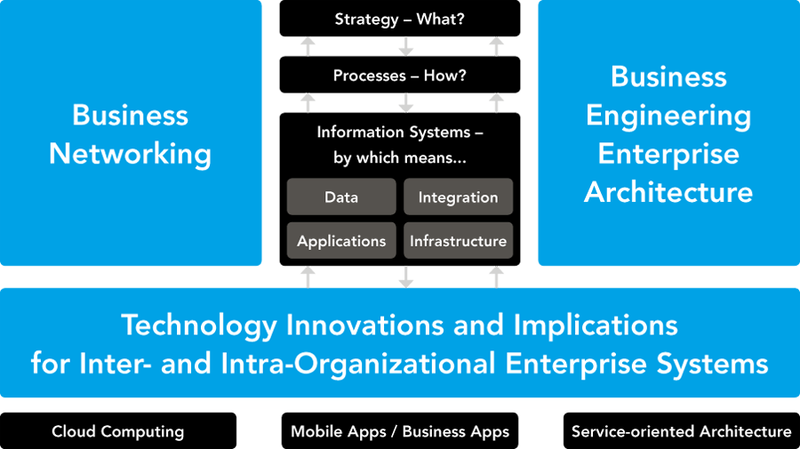 Innovative information technologies are enablers for organizational change and business innovation, both within enterprises and across their entire value network. Our research investigates the implications of new technologies for businesses and the use of information systems in an organizational context. We aim at supporting organizations in leveraging technology innovations and designing sustainable business & information systems architectures. Business networking architecture and methodology: How can companies (re-)design inter-organizational relationships and (re-)shape their business network based on latest technologies? Business cloud / service cloud: How can cloud computing and mobile technologies be leveraged for improving the coordination in global value networks? B2B standards and interoperability: Which inter-organizational interoperability issues and coordination problems emerge as a result of increasing levels of external integration? Design principles and metrics: How should companies design and manage their enterprise architectures in an increasingly volatile business environment? IT-driven architecture management: How can companies implement architecture thinking and principles in their IT processes (plan, build, run). As an underlying framework, our research uses the business engineering approach developed at University of St. Gallen.